London, British Museum, no. F.f.1-15. Red chalk over faint outlines in black chalk, 26.7 x 12.9; wm? ; there is a red chalk line around the edge of the sheet. Inscribed with the number 2 upside down on the verso. The sheet has been trimmed up to the figure, cutting off a bit of his hair, the tip of his staff, and part of his feet; cleaned and former stains near the head, at lower left, and elsewhere removed or lightened by 1986. PROVENANCE: C.M. Cracherode; bequeathed to the museum in 1799. W.H. Carpenter, Manuscript catalogue of the Cracherode Collection, Department of Prints and Drawings, British Museum, 1845, as Rosso. Kusenberg, 1931, 137, 142, no. 52, as perhaps by Rosso, around 1527-30; he mentions that the drawing is attributed to Nicolò dell’Abate. Barocchi, 1950, 226-7, n. 3, repeats Kusenberg. Carroll, 1964 (1976), I, Bk. I, 239, 241-242, II, 376-380, D.41, Bk. III, Fig. 106, as done between 1533 and 1536. Carroll, 1966, 172, Fig. 6, 175-176, as Rosso and done in France. Béguin, in EdF, 1972, 184, Fig., 185, no. 208, as Rosso, and done in France or in Arezzo. Turner, 1986, 152, no. 109, Fig., as Rosso, and done immediately before his departure for France in 1530. Carroll, 1987, 160-161, no. 54, with Fig., as Rosso, 1529. Franklin, 1988, 326, no. 54, discussed the relation of black and red chalks. Mundy, 1988, 79, as possibly done c. 1521 because of its relation to the Volterra Deposition. Joukovsky, 1992, 31, n. 2, noted the figure as analogous to the old man at the right in the Sacrifice in the Gallery of Francis I.
Franklin, 1994, 259, as Rosso and representing a standing saint; discussed in the context of Rosso’s Aretine period. 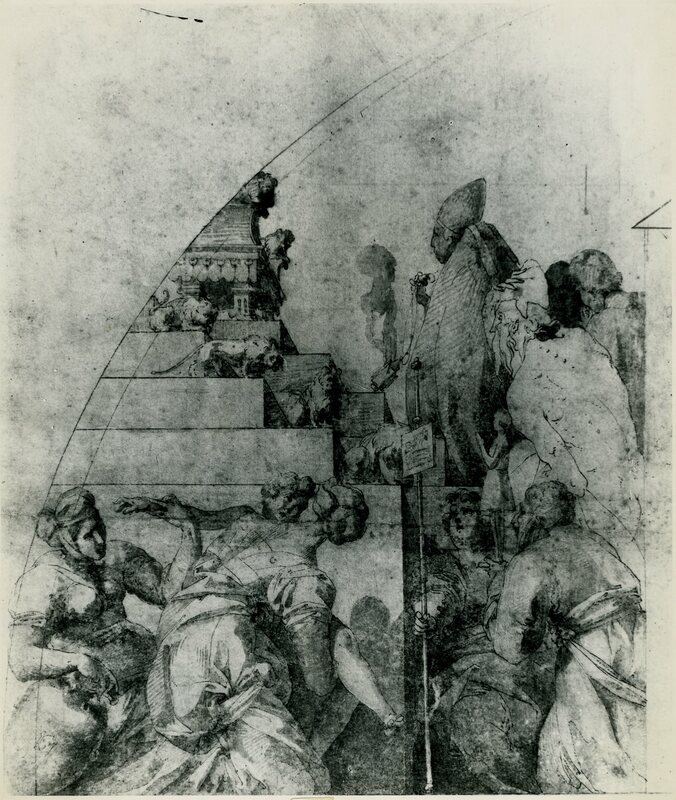 This drawing is very similar to the Madonna della Misericordia of 1529, in the Louvre (Fig.D.35a), in regard to the kind of thin, old, and bearded figure that is represented, to the way in which the drapery is described in angular planes arranged parallel to each other, to the particular character of details such as the long locks of hair and beard, and to the handling of the red chalk to create fine clear contours and transparent shadows by carefully placed parallel lines. The head of the figure resembles that of the man wearing a turban next to the Virgin in the Borgo Sansepolcro Pietà of 1527-1528 (Fig.P.19a). But the drapery of the figure looks most like that of Christ in the Christ in Glory executed in 1529-1530 (Fig.P.20a). It is a type of figure that goes all the way back to the apostle second from the left edge of Rosso’s Assumption of 1513-1514 (Fig.P.3a). There can be no doubt about Rosso’s authorship of this drawing. 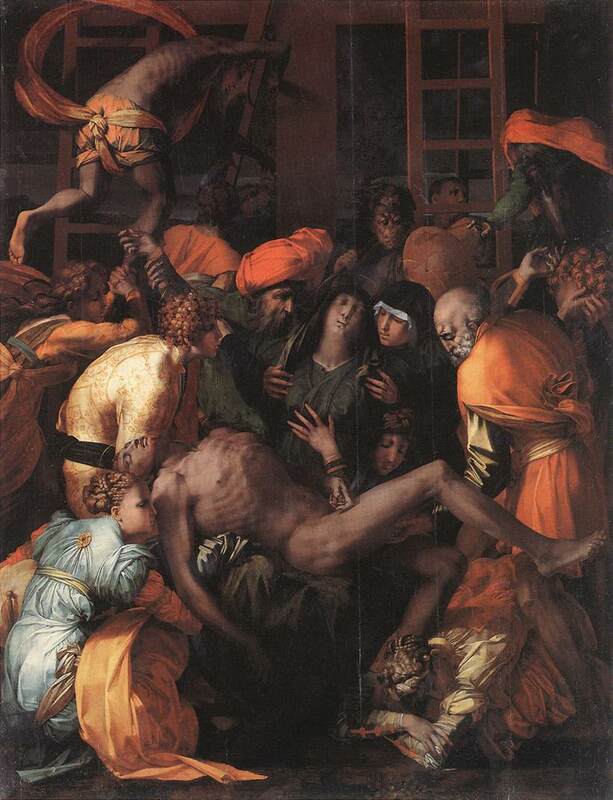 Although it is most likely that it was done in 1529, about the same time as the Madonna della Misericordia, there is a degree of flatness in the Standing Apostle and a degree of abstractness in the shapes of its drapery that suggest it was executed slightly later than the Louvre drawing. These aspects of the British Museum drawing, as well as its sharp contours and concise areas of shadow, make it appear the equivalent in red chalk of the Throne of Solomon of 1529 (Fig.D.34), drawn in pen and ink and wash. In 1845, the drawing was already given to Rosso but subsequently it was thought to be by Nicolò dell’Abate. I once held that the drawing was done by Rosso in his French period. 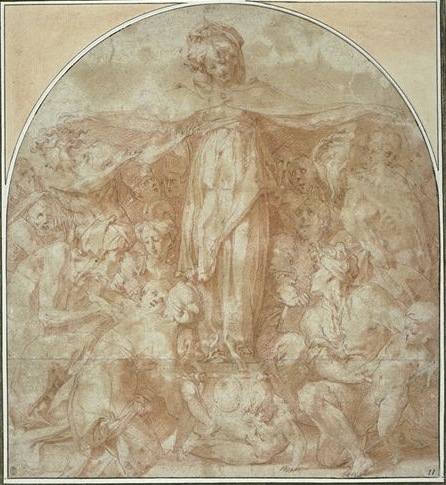 It is, however, more reasonably placed around 1529, a date in Rosso’s late Italian period that is supported not only by its style but also by the fact that a drawing in the Uffizi (see below), attributed to Vasari and very possibly by him, shows one figure derived from Rosso’s drawing. It is very possible that the Aretine artist got Rosso’s drawing directly from the artist in Arezzo shortly after he made it, just before he fled and soon thereafter left for France. DERIVATION: Florence, Uffizi, no. 7061F. Four Figures (Fig.D.36, Derivation). Black chalk and wash, 18.7 x 26.1. LITERATURE: Carroll, 1987, 160, n. 1, under no. 54, as probably an early drawing by Vasari. Franklin, 1994, 295, n. 124, as an early drawing by Vasari. 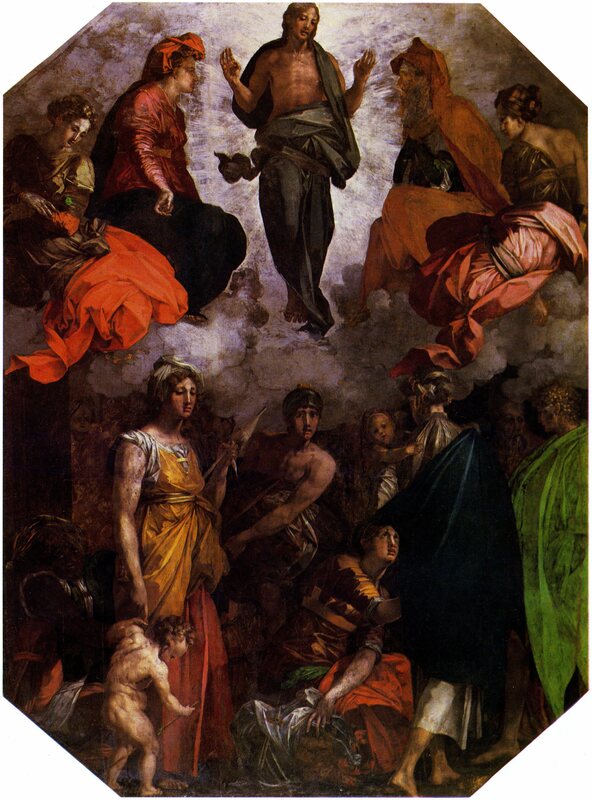 The figure at the far right representing St. Paul is dependent upon Rosso’s drawing. The position of the arms is changed, the figure carries a sword, his proportions are squatter, and his head is of a broader type. But the drapery of the figure follows Rosso’s drawing almost line for line. 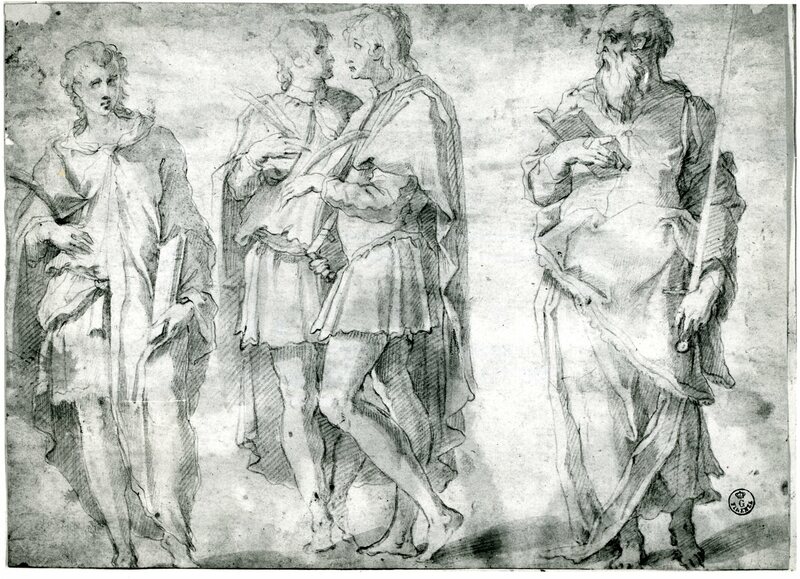 The other three figures on the sheet do not recall Rosso, but then neither does the fourth without actually seeing its connection with his drawing in the British Museum. In the Uffizi, the drawing is attributed to Vasari and it does seem to be an early drawing by him. In all likelihood, this attribution would have to mean that Rosso’s drawing was made in Italy, and very possibly that it belonged to Vasari. The fact that the Four Figures is in the collection at the Uffizi tends alone to support an Italian, rather than a French, origin for Rosso’s drawing. 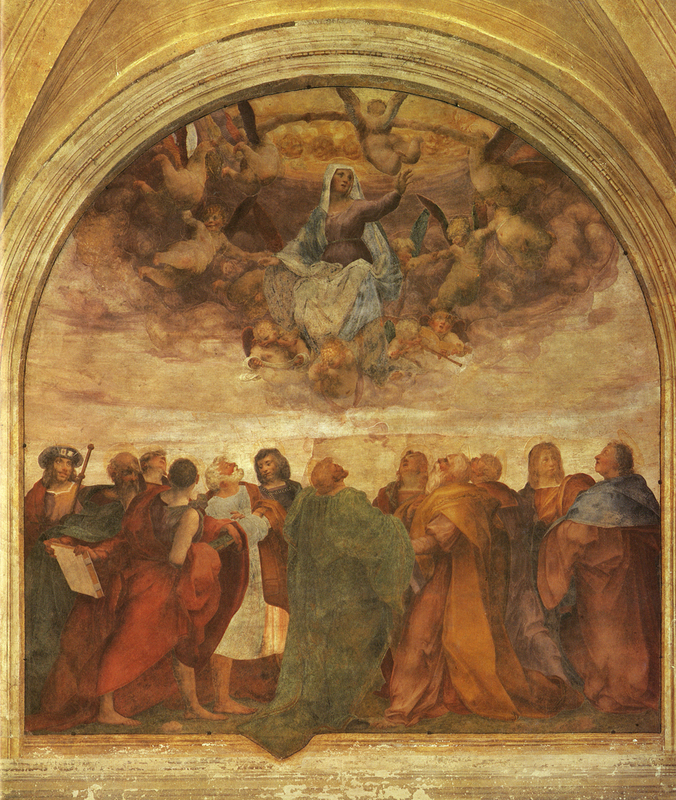 Franklin, 1994, 295, 124, noted that the influence of Rosso’s drawing is also evident in a drawing by Vasari of St. John the Evangelist in Munich (inv. 1964. 58).